Astronomy Now - Mars orbiter photographs still-silent Opportunity rover | Astro What? NASA’s Opportunity Mars rover remains silent more than three months after slipping into electronic hibernation in the wake of a global dust storm that swept across the red planet in June, blocking out the sun and draining its batteries. But anxious flight controllers at least know where to focus their hopes and good wishes, thanks to an image from the Mars Reconnaissance Orbiter that shows the long-lived rover on the slopes of Perseverance Valley where Opportunity was exploring before it fell silent. 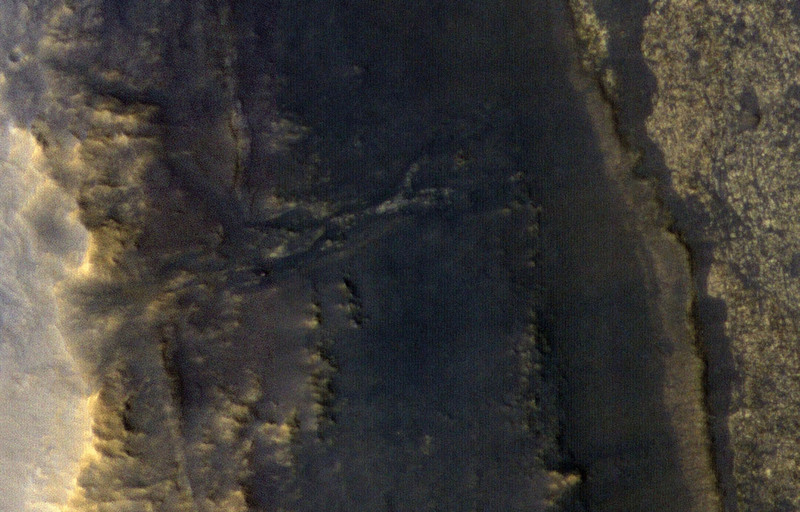 From the orbiter’s 267-kilometre (166-mile) altitude, Opportunity appears as a small dot-like feature on the dusty martian surface. But it’s visibility provides clear evidence the dust storm has abated, allowing sunlight to once again fall on the rover’s solar cells. Flight controllers at the Jet Propulsion Laboratory in Pasadena, Calif., are using NASA’s Deep Space Network antennas to listen for any signs of life from the rover and are now sending commands “in the blind” in hopes of helping the robot to reset its presumably out-of-synch clock to pave the way for a resumption of communication. Launched in 2003, Opportunity landed on Mars in January 2004. The rover had a design life of just 90 days, but it continued operations well into its 14th year before the summer dust storm knocked it out of action. Flight controllers remain hopeful Opportunity will eventually wake up and phone home, but they cannot rule out the possibility of a fatal storm-related failure.